Providence, R.I. Capitol. It took up half the state. All the fist pumping really kind of messed things up for us going into Jersey. I kind of started ignoring Sh’niqua (the navigation system in my Android) and ended up missing the exit for the Jersey Turnpike. But, after a quick detour through Camden, we were back on our way. Fun fact about Jersey Danielle dug up on Wikipedia: It’s the doughnut capital of the world. When someone says “America runs on Dunkin’,” what they actually mean is “Jersey runs on Dunkin’.” Of course we stopped at a Dunkin’ Donuts for an afternoon snack and quizzed an employee. She had no idea if Jersey was the doughnut capital of the world and seemed to think we were crazy for asking. The second leg of our journey brought me to places I haven’t been before. New Jersey, Connecticut, Rhode Island and Massachusetts were all new experiences for me. I tried not to let Jersey Shore influence my opinion of the state, but still, I think I’ll be OK if I don’t ever see it again. Connecticut was nice when we passed through, but it was getting dark. We didn’t get to see much until we came back through Sunday afternoon. Hartford was a beautiful city. It was dark by the time we got to Rhode Island, but the smell alone was enough to forgive the itty bitty place for not being big enough to really be called a state. The entire state – all two square miles of it – smelled of pine. It was a great, fresh scent. The only thing we really saw was the capitol in Providence. As capitols go, it was pretty impressive. Our original plan was to stop over in Boston for dinner and take a little time to explore the city. 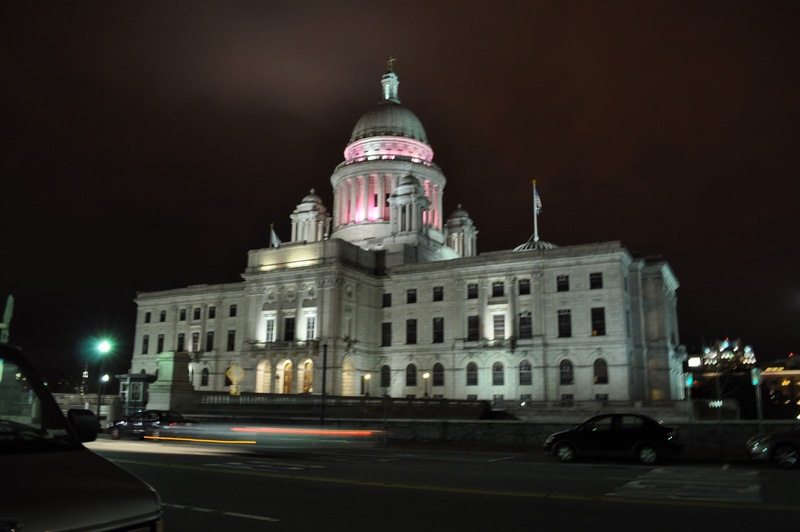 But that plan didn’t allow for us not arriving to the home of the Sox until 11 p.m. We couldn’t find parking for less than $15 – one garage was charging $27 for the night – so we illegally parked in a handicapped spot next to the capitol, took a few pictures and headed to Salem, Mass. Salem is about an hour from Boston and an hour from Manchester, N.H., where we had reservations to stay the night. The drive to Salem wasn’t bad, and the town was charming, even though we were all waiting for the Sanderson sisters to fly down the street at any moment. The drive between Salem and Manchester was a little more interesting. We’d been in the car for about 15 hours at this point, and I was tired. We couldn’t get to that hotel fast enough. This entry was posted in Boston, Connecticut, East Coast Extravaganza, Massachusetts, New Hampshire, New Jersey, SHFW and tagged Connecticut, Dunkin' Donuts, East Coast Extravaganza, Jersey Turnpike, Massachusetts, Rhode Island, Salem, SHFW by Cassie. Bookmark the permalink.